Nearly 90 adolescent girls and women Chattrpur and Rangailunda blocks are already getting orders for stitching uniforms for schools kids ahead of the academic year. The tailoring trainings helped the participants learn the nuances of cutting and stitching of different ladies wear and school uniforms. The women are now confident and interested to start their own micro enterprises for self-employability. Unemployed youth in the villages were provided boat repairing training by technical experts who taught them how to repair the engines and other technical requirements in a boat.Since most of the villages continue to be surrounded by water bodies and use boats to communicate, such training is expect to benefit the youth and provide them with an alternative income. Interestingly, many fishermen attended the training in order to learn the nuances and working of a boat. K Sritam , a fisherman from Markandi village admitted that they often face difficulty for the lack of proper boar mechanics. At times the boats in need of repair have to wait for over a month till they get repaired. This amounts to a loss of income for the owners. “There are only a few mechanics available and they charge too much for minor repair. Also it is not wise to allow untrained people to repair the boats even if they charge less,” said Sritam. “My friend has already migrated to the state capital in search of job. I was planning the same but with this training I guess I can survive and earn a good income in my own village. 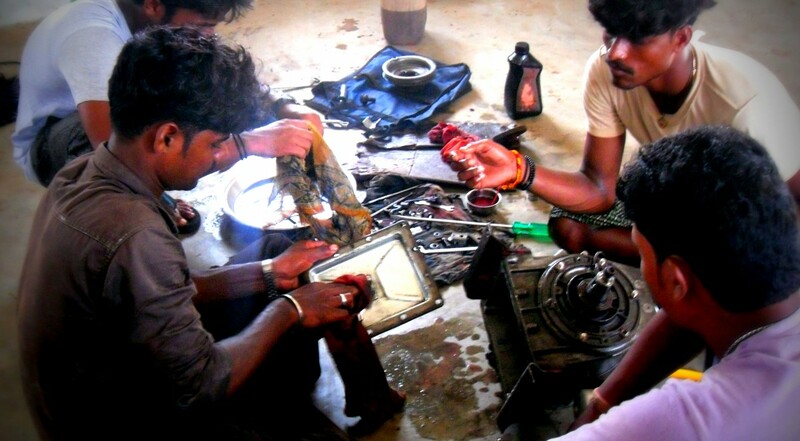 I am already being contacted for repairs every alternative days and hope that things will get even better,” said Murali Reddy, one of the youth who got trained.